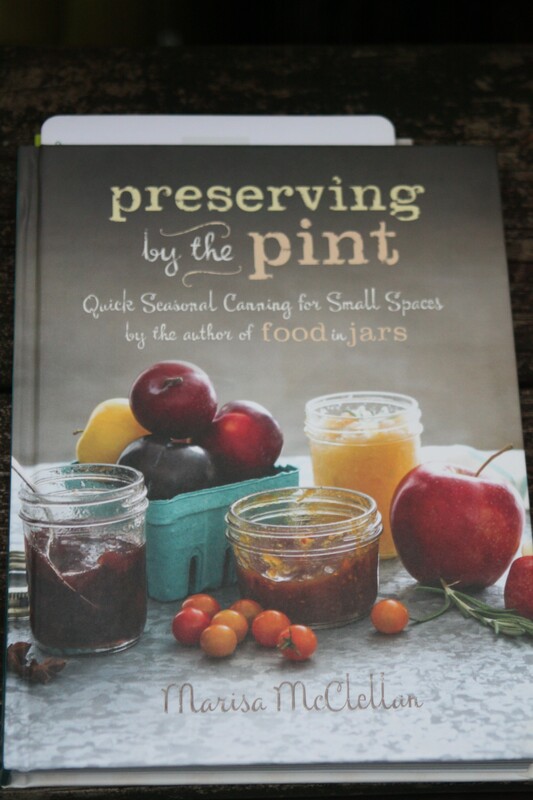 So I finally got around into digging into Preserving by the Pint. And by digging into, I mean, making a few things out of it. I was looking up something else at the time, when I sort of flipped past the recipe for Pickled Eggplant with Mint. I was intrigued. I had bought an eggplant Saturday morning at market and by Sunday morning had realized my dinner plan for the week meant I was going to be putting the eggplant up rather than serving it. (I buy what looks good, then menu plan. Sometimes it works out, other times it leads to some interesting experiments.) The eggplant was described as having a tender but not mushy texture. It was recommended being served drizzled with olive oil, paired with feta cheese and bread. I immediately could see myself eating this with Mollie and Teresa, which meant I had to make it. The eggplant is simmered in red wine vinegar for just a few minutes, then tossed with salt, garlic and mint. It’s packed in jars, the vinegar is poured over, you process it and voila. I love an easy pickle recipe and this definitely was easy. I snuck a taste of the eggplant post-simmering, pre-seasoning and I was intrigued. I cannot wait to see how these turn out. I’m pretty sure it’s gonna be good. The only note I want to make about this recipe is that the yield is stated as 3 half pints. I did not weigh the eggplant I used – it was a smaller to medium size fruit, so I don’t know how close or off it was from the pound of eggplant specified in the recipe. I yielded five and a half half pints, but did not have to add any additional vinegar. I’m thinking the extra jars might become my go-to pot luck item this fall. I’d also grabbed a few green tomatoes to make fried green tomato sandwiches for dinner one night. Farmer Brown threw a few more in the bag was I was walking away with my box of tomatoes, so I had a few extra to play with. 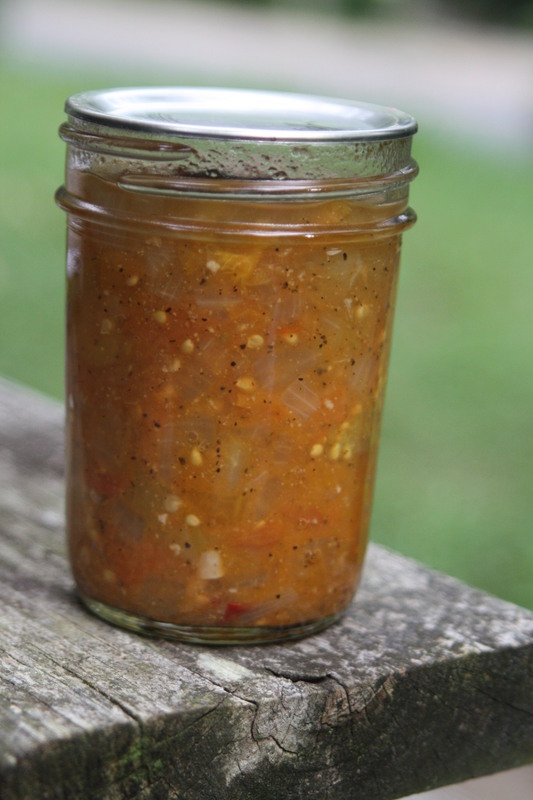 I thought I’d try the green tomato salsa recipe also in Preserving by the Pint, but by the time I got around to making it on Tuesday, only two tomatoes had stayed firmly green. The rest had started turning and I’m sure had I let them sit, they’d have ripened up. Given I have a dining room table full of tomatoes, I went ahead and make the salsa, resulting in a slightly more colorful salsa than originally intended. While I spend a good bit of time from about mid-strawberry season straight through to the holidays putting up produce in some fashion, this year I haven’t felt like I’ve been experimenting that much. I’ve actually tried some new recipes – the black forest jam is one, boozy cheeries is another, but those were new recipes with items I put up every year. I’m not sure why the pickled eggplant feels like I’m branching out big time – they’re pickled, which is never a stretch and after my previous success with putting up eggplant, I vowed to myself to put more up this season. Funny how one new thing can make you feel like you’ve expanded your world and your palette exponentially. Anyway. Mollie, Teresa, next time I see you, we’re trying out this pickled eggplant with mint. All that, with shooting stars and rainbows. Sometimes I do put just a little planning into it, but as long as there is fresh corn & okra, that is what’s going to be for dinner, every week. I’m intrigued. Let us know how it turned out! I have mixed feelings about eggplant, although I did recently learn that it actually has nutritional value. I used to think it was a big bitter blob of nothing. I like it in baba ganoush form, but that’s about it. I will absolutely let you know how it turns out! I am impressed by that eggplant recipe. Would never have thought to can it, same fear of mush! I learned that frozen eggplant isn’t mushy this past year, so I figured I’d try it out! Your jars of yumminess look fantastic. I’ve added this book to my wish list and “Food in Jars” also. Thanks for the inspiration. Preserving by the Pint has been more of a slow burn in liking it. I had to really dig into to it before it clicked. Food in Jars though is an essential. I tell that to all my canning students. Ah, okay. I’ll get that one instead then. I just have a small Ball book that I acquired years ago (I think it came with my kettle or jars, I can’t remember). It’s not very inspiring. Thanks for letting me know which one to start with. The Ball books are the bibles in canning. Every recipe published in any other canning cookbooks are basically slight variations on everything in Ball. I tell all my canning students, if you only get one canning cookbook, get the big Ball one. Then get Food in Jars and if you like making pickles, The Joy of Pickling. 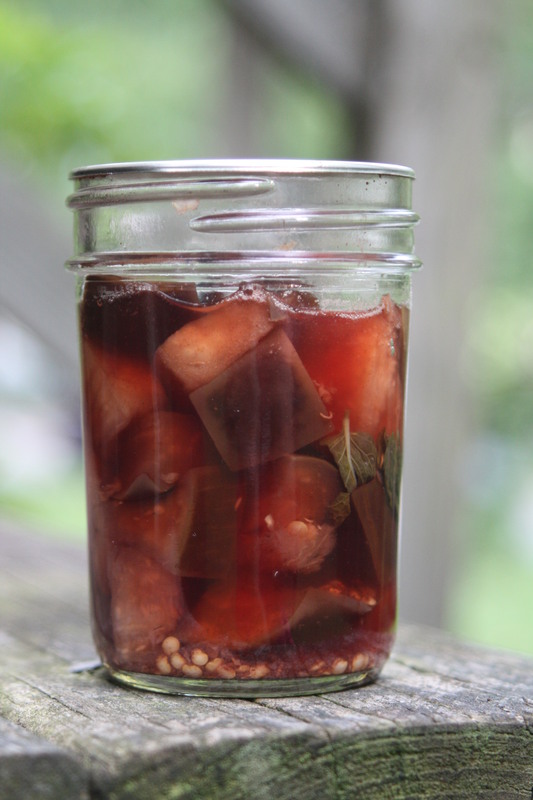 I never thought of pickling eggplant. Genius! 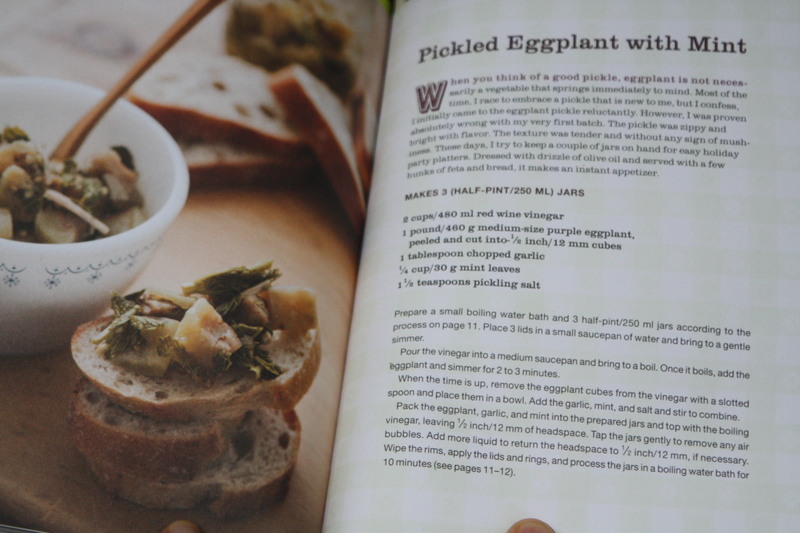 Joy of Pickling has a number of eggplant recipes in it, but I loved the idea of using mint!